Casa Osiris Boutique Hostel is a colonial building of three stories. The building has a huge kitchen where guest can prepare their meals. Casa Osris has staircase, not elevators. We have a common terrace with a bar. All guests are invited to enjoy our bar. 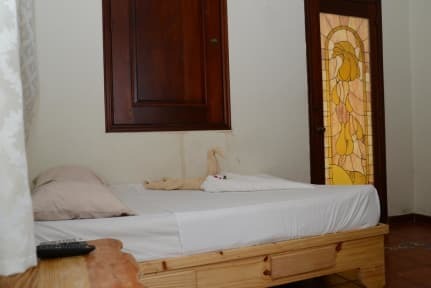 Guests are walking distance from famous street El Conde, The Primate Cathedral of America, the Christopher Columbus main square and the Malecon. Casa Osiris is at Jose Gabriel Garcia street, between 19 de Marzo street and Sanchez Street. One street below is Kennedy street or the Malecon as is popularly known Guests are walking distance from famous street El Conde, The primate Cathedral of America, the Christopher Columbus main square and the Malecon. We have 2 double rooms with private bathrooms. 3 double Rooms with a share bath. 1 double one room with a private balcony and private bath. 15 private single bunk bedrooms with a share bath. All guest in romos can use kitchen and common áreas.